In the debate between the Ecobee 4 vs Nest smart thermostats, each has their own pros and cons, which will help you decide which smart thermostat to invest in. Read on to find out the Ecobee 4 pros and cons as well as the Nest pros and cons. There have been great advances in smart technology in recent years, which has seen our homes become increasingly intelligent. Joining the smart TV, the smart speaker and even the smart kettle is the smart thermostat, which allows the control of heating and cooling systems from anywhere through their Wi-Fi connectivity. They can also help reduce your energy bills, and many of them have learning capabilities to work efficiently with the routines in your home. The smart thermostat is the perfect addition to the modern home, but with more models being developed all the time, how do you know which device will be the best one for your home? With their 4th generation model, Ecobee has released their best smart thermostat to date. The Ecobee 4 features a responsive touchscreen display, a remote sensor, as well as a number of additional features, including a built-in Amazon Alexa speaker. This device is easy to use, is compatible with all heating and cooling systems, and can be controlled remotely through the mobile app. • Built-in Alexa – Whereas the latest model of the Nest is compatible with Amazon Alexa, the Ecobee 4 actually has a built-in Amazon Alexa speaker. For those who are looking to upgrade their home with smart technology, the Ecobee 4 is an attractive prospect, being 2 smart devices in 1, plus it means that you can control your heating with voice commands. • Excellent Features – The Ecobee 4 has an impressive array of features, which can be controlled via the touchscreen or the mobile app. It is compatible with both Amazon Alexa and Apple Homekit, whilst the Nest is yet to be made compatible with Apple operating systems. Furthermore, the Ecobee has an extremely useful ‘Follow Me’ mode, which uses room sensors (included in the kit), which detect which room of the house is occupied and use that room to take a temperature reading. This not only keeps the occupied rooms at the desired temperature but saves on energy bills by only using certain rooms to control the overall home temperature. Additionally, the ‘Home/Away’ feature detects if the home is occupied, automatically switching off if no one is at home. • No Sunblock Feature – The Nest has a pretty nifty ‘sunblock’ feature, which detects when the thermostat is in direct sunlight, being aware that the temperature reading will be higher than it actually is. The Nest then well adjust its settings to compensate for the temperature. The Ecobee does not have such a feature, but it does have room sensors, which feedback the temperatures in the corresponding rooms to the base unit. However, the Nest’s ‘sunblock’ feature is a much simpler solution to the problem of direct sunlight affecting temperature readings. • No Battery Back Up – The Ecobee 4 does not have a battery back up power source, unlike the Nest, which comes with a large rechargeable lithium-ion battery pack, which can last a good few months fully charged. The Ecobee 4 draws its power through the C-wire, which some older homes may not have, they compensate for this by providing a Power Extender Kit (PEK). The Nest, now in its third generation, was groundbreaking in the smart thermostat market, as it has a learning capacity. This means that it does not require any programming, instead of having the ability to form its own programs, based on the daily routines in the home, which often results in savings on energy bills. The stylish device does not feature a touchscreen, instead of being controlled by the turn of a dial. The Nest is compatible with all heating and cooling systems, as well as some other smart devices, and it can be controlled on the go through the mobile app. • Easy Integration – Although the Nest thermostat is not compatible with Apple Homekit like the Ecobee 4, it will integrate easily with most smart home systems, including Amazon Alexa, Wink, Google Assistant and more. Furthermore, the Nest Secure feature means it can access smart light bulbs to get attention in the event of an emergency, and a smart washer and dryer can utilize energy usage date from the Nest, and initiate their next run when the energy demand is low. • Energy Saving – Whilst the Ecobee 4 has features that help with energy efficiency, the Nest goes one step further in reducing those energy bills. The learning capacity of the Nest means that once it has learned the routines of the home, it will recommend temperature settings. When the green leaf icon appears on the screen, you know you have reached the right balance between temperature and energy efficiency. Furthermore, the Nest will switch to standby mode automatically, if no movement has been detected for two hours, and you can get reports on energy usage and efficiency, and adjust routines accordingly. • So Stylish – The Nest remains as arguably the most stylish smart thermostat on the market today. Although the Ecobee 4 has an edgy futuristic design, with a simple to use touchscreen and rounded edges, this is not a match for the sleek Nest circular design, with its innovative dial control, and motion sensor glow. • Room Sensors Sold Separately – Recently Nest released remote sensors that could be purchased separately, the Ecobee 4 comes with one remote sensor that can be placed in any room of the home for more accurate temperature readings and management of hot and cold spots in the home. Ecobee 4 also sells sensors separately in packs of two. • Wi-Fi Issues – The Ecobee 4 is hardwired into the home and comes with a Power Extension Kit, for home which does not have a C-Wire, this means that the Wi-Fi connectivity is highly unlikely to ever drop out. The Nest does not come with a Power Extension Kit, and although it can function without a Control wire, by powering the Wi-Fi from the excess in the D and G wire, the Wi-Fi connection can drop out if there is insufficient power to access the heating system of your home. It seems like the ever popular Nest thermostat has some competition for the best on the market, with the Ecobee 4. 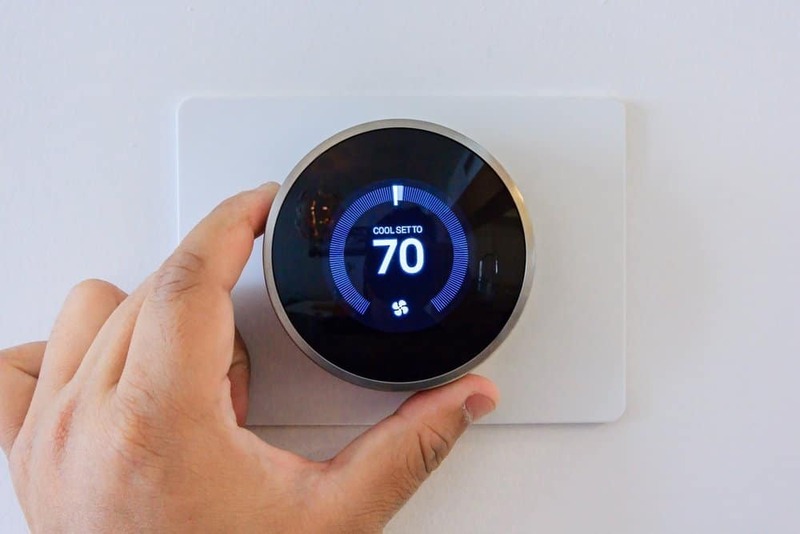 The Nest thermostat has continued to build on its strong initial model, with their 3rd generation model, and the Ecobee thermostat has added new innovations, as yet to be seen in other models, with their 4th generation. It seems like both these smart thermostats have very similar features, are of similar prices, and both have mobile apps and the ability to save on energy bills. Therefore, either of these smart thermostats would be a great addition to any home. If you are looking for a thermostat that requires minimal programming and is compatible with a wide range of smart devices, then the Nest is probably the better choice. However, if you want a reliable thermostat, that comes with a room sensor and integrated smart speaker, it has to be the Ecobee 4. There is also the popular Honeywell 9000 which is another popular smart thermostat choice and worth consideration. See how it compares with the Nest. Of course, these thermostats are expensive, so if you are looking for a cheaper option, check out our guide to the best programmable thermostat under $50. Honeywell 9000 vs Nest Pros & Cons – Which is right for you? I went with the ecobee because it was supposed to have great reports, and we were going to be installing insulation so wanted to see the difference it made. But the reports are pitiful. You can’t even see how many hours your HVAC has been running like you can on the Nest, and though they have multiple reports online, they aren’t sophisticated analysis at all. They’re just displays of when the ecobee was in Home vs. Away vs. Sleep mode, or when it was running–but the runtime report doesn’t give totals, so you have to eyeball it. Plus, none of the reports can be seen on the ecobee itself or even in the app; you have to get a computer and log into the website. I finally found beestat.io, which some frustrated ecobee user finally developed himself to get some use out of all the data that ecobee is doing nothing with. In addition ecobee’s geofencing is fatally flawed. If you come back and geofencing sets the profile to Home, that overrides your normal schedule until you either leave or manually change it. What this means is that if you have geofencing enabled, ecobee never enters Sleep mode, so your house doesn’t cool down at night when you’re going to sleep. Unless you manually change it, which defeats the whole purpose of a thermostat like this. I have friends with Nest who don’t have stupid issues like this. Nest may not be perfect, but ecobee has absolutely ridiculous flaws that make it pretty much just an expensive wifi-enabled thermostat for us. If I did it again, I’d just get a basic wifi thermostat.